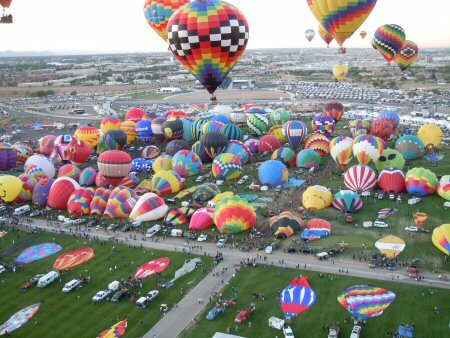 This year's fall trip is to the Albuquerque International Balloon Festival to fulfill a bucket list item of riding in a hot air balloon. Day 1, 117 miles....117 total miles--No pictures today. Left the ranch at 3:30pm and arrived at the Hampton Inn in Enid around 6PM. Had a very good Mexican dinner with Tony, Tyna, and Kensie then returned to the Hampton for a nice swim. 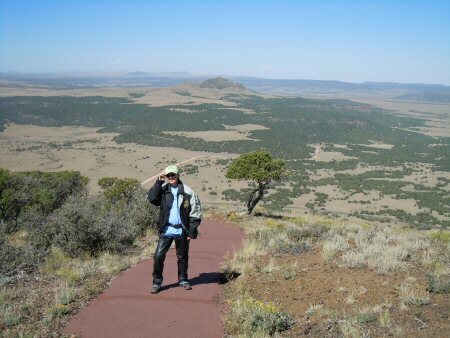 Headed to Black Mesa State Park to camp out tomorrow night. Day 2, 360 miles....477 total miles--Temps were perfect today....but the wind was terrible. Just thankful it was a cool north gale rather than a hot south one. We made it to Black Mesa State Park and found a campsite. All was good until Kathleen saw the sign posted at the restroom saying "What to do if you encounter a Moutain Lion". Yikes !!! It is just a small tent. No room for kitties. I assured her it was OK and to just stay close to me ( I have Kimberly with me ). 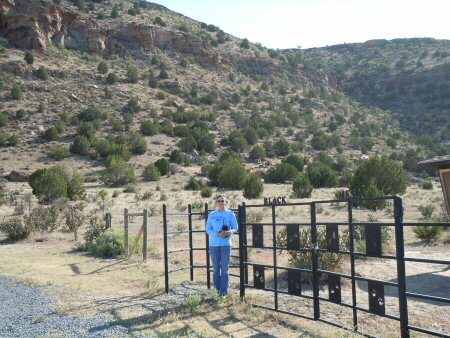 We then drove on the other 15 miles or so to the actual Black Mesa just north of Kenton, Ok. Found the trail that goes to the top but it was a 4.3 mile, 5 hour hike. Since we didn't have that much daylight left we headed back to the campsite and took a couple of hiking trails there. Saw several deer on the trail. Still a burn ban here too so we are glad we picked up a Subway for dinner. Just waiting for it to get dark now. The sky is cloudless so we are anticipating a spectacular show of stars tonight. Day 3, 305 miles....782 total miles-- The sky last night was UNBELIEVABLE !! That was what I was hoping for. I haven't seen the Milky Way like that since I was a small child.....it stretched from the horizon one side of the sky to the opposite side. It almost looked cloudy....milky....there were so many stars. Woke up to temps in the lower 40's....it was a cool night. 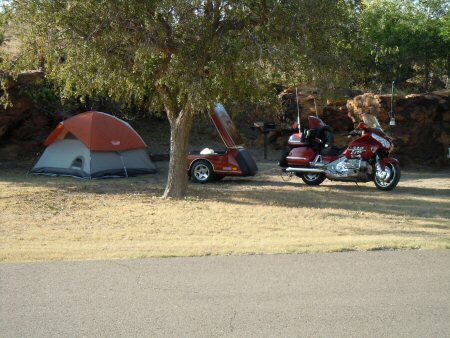 A very nice ride to Clayton, NM where we enjoyed breakfast.....then on to Mt. 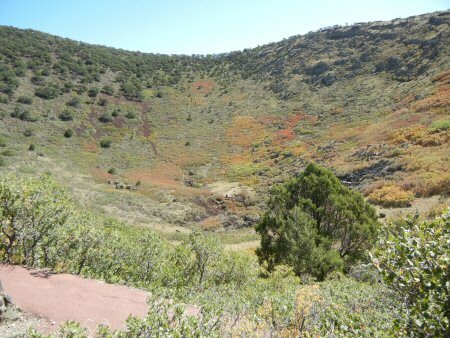 Capulin, a volcano cinder cone that is a National Monument. Fierce crosswinds again today....but out of the south this time. Kathleen got to wear her favorite outfit (rainsuit)today. It was a light shower while we traveled to Eagles Nest. Beautiful Aspens have begun changing colors. We arrived at our motel in Espanola......yikes.....Kathleen is sticking very close to me ( and Kimberly ). If there were any other choices than this Comfort Inn we would be going elsewhere. We have barricaded ourselves in the room overlooking the bike. 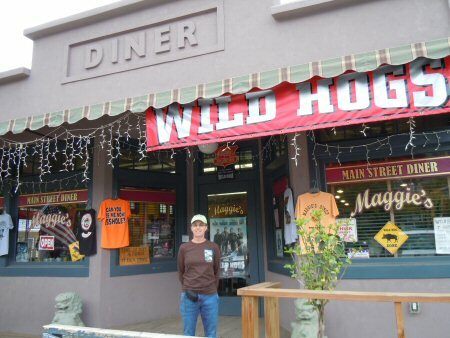 Day 4, -- We left Espanola fairly early and headed to Los Alamos where we had a great breakfast. 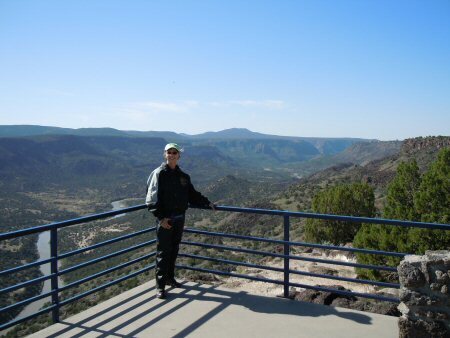 It was a beautiful ride on the Jemez Mountain Trail to Albuquerque. 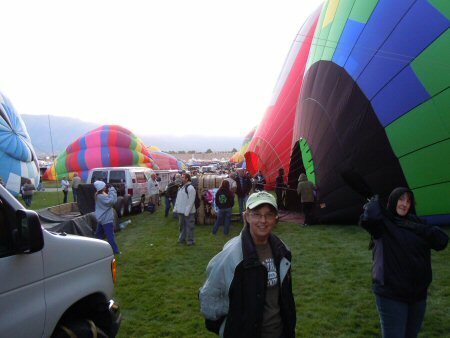 We arrived in time to check into the Hilton and then went out to the Balloon Fiesta where we have tickets to the Gondola Club for dinner, the "After Glow", and fireworks. The weather was absolutely perfect. They said this was the best "After Glow" in years. Back to the hotel by about 10pm and straight to bed since we have to get up at 3:30am to get back to the Balloon Fiesta Park in time to check in for our balloon ride. Day 6, 228 miles....1225 total miles--We decided to head for home....slowly.... due to rains forecast to move into the area. 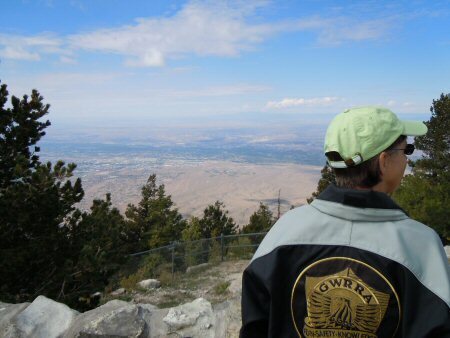 We drove to the top (10,600ft) of Sandia Crest overlooking Albuquerque. 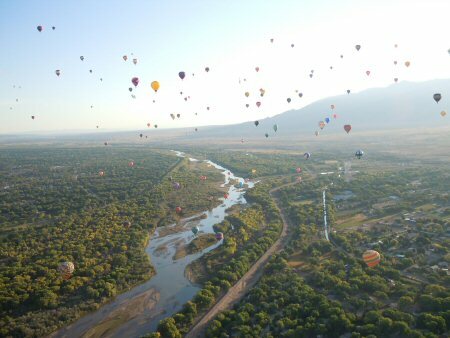 It was a wonderful ride and great view.....looking down on Albuquerque. 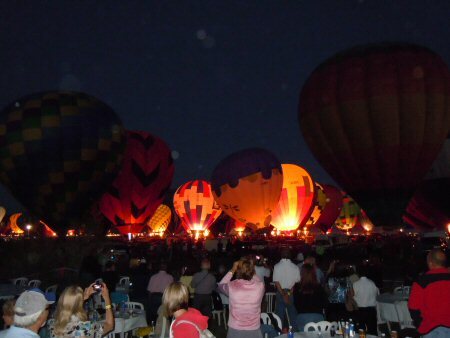 We could even see the Balloon Fiesta field. 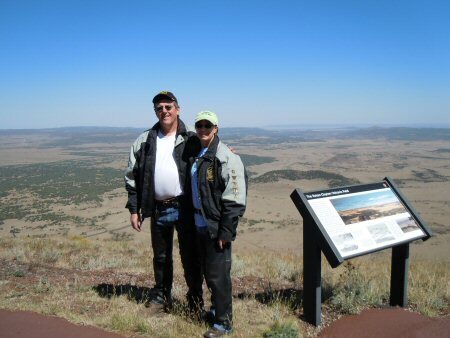 We took the scenic "Turquoise Trail" ride thru the high country to Taos. We went thru Madrid.....and saw Maggies Diner in the Wild Hogs movie that we like so much. Kathleen got to put on her favorite outfit again today but just light rain. We were lucky that the heavy storm was ahead of us and we stopped in Taos before we caught it. Day 7, 225 miles....1500 total miles--Left Taos with Woodward, OK as our goal. However we stopped at Clayton, NM for a rest from the wind and a snack, so I called just to find out that all the preferred motels in Woodward were all booked up. So we altered our route more SE towards Elk City, OK. The cross wind was ferocious so we decided to stop at Dumas, Tx. Hopefully, the storm blowing in will not catch up to us for tomorrow's continued journey home. Day 8, 310 miles....1810 total miles--wow !!! The cross wind followed us all the way home......you can thank us for bringing a big storm hot on our heels. We got sprinkled on, off and on, but avoided the heavy rain following us. The scenary cutting thru the Texas panhandle on HWY 152 was much better than the OK panhandle. 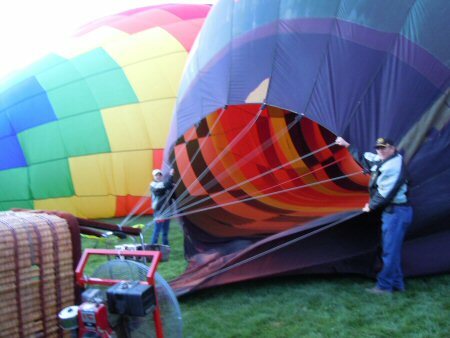 Hope to see it again someday with in a more upright fashion ( not pushed to 45 degree angle by the wind ).